cycling in Surrey, Sussex, Hampshire and beyond….. The Grade 3 ride on Wednesday 24th September starts at Ripley at 09h45, with tea at Bocketts Farm via Effingham Common and Bookham. We then head due south to Newdigate and Rusper and south-east to Warnham and Rowhook. Lunch will be at the Scarlett Arms at Walliswood. The return to Ripley will put to the vote at lunch but the direct options are via Shere or Abinger Hammer, then Combe Bottom and East Clandon. Overall, quiet roads, 50 miles with a few nice climbs. Weather wise it looks set to be a good day, max temperature 18 degrees with the possibility of a short rain shower over lunch – bring a light rain jacket. 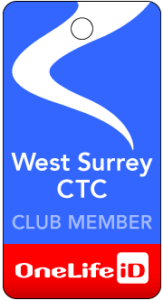 Cycle Maintenance for WSCTC Members at Evans in Guildford – responses please!